that will help ensure that you start your vending machine business with success. Many people are considering vending as a business as a hot idea right now. They are looking into this as way to bring in passive income with little effort. Don't take the perceived simplicity of vending as a business for granted. There are many elements that have to take place before your vending machine business can be a success. Thus, we have put together a series of articles to help you to think through the various facets involved with starting a vending machine business. When looking into vending as a business, research is crucial. Below are three key vending business reasearch tips that will help you to start your vending machine business. Starting A Vending Machine Business Research Tip One - Determine What Will Work. Start looking around in local businesses to see what types of vending machines are already place. Talk to some of the business owners who have vending machines in their establishments. Ask them whether they think a vending machine business idea is worth the fuss. Let them know up front that you are new to the vending machine business and would like to know which type of vending ideas make a it is a feasible idea for your local area. Also, begin to watch how people react to vending machines. Do most people even notice them? Or is there a certain demographic that seems to be drawn to them? For instance, many parents of young children will tell you that their child notices every vending machine, while people without small children may walk by and never even notice. Starting A Vending Machine Business Research Tip Two - Research Vending Product Ideas. Also, begin to price the type of items that you think will be feasible to place in your vending machine. Think through whether or not you really want to hassel with food items and vending items that have a short shelf life. 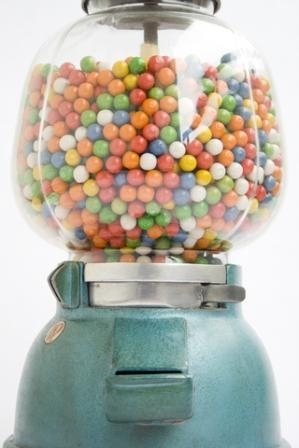 And yes, while we often see those vending machines with the bubble-gum and the candy, many vending machine business veterans will tell you how they have to change out their inventory due to their gum or candy becoming stale. Vending licensing requirements varies by state, many will require you to have a business license for your vending business, but other states may have different regulations. Be sure to contact your state's licensing department to see what the rules are in your state. If you do not use vending machines often, you may be surprised to learn of the various items you can buy from vending machines these days. Healthy vending machines are becoming very popular as people have made a campaign against junk food machines. Foods served hot are quite popular because it means the food is pre-heated and there is no need to microwave it. Of course, these are more expensive, but have potential in the right setting. DVD rentals have become quite popular small business ideas and the vending machines are popping up outside of drugstores, grocery stores, and even in malls. Vending machines that offer fitness supplies, such as water, protein drinks, energy drinks, and energy bars, which you can find at clubs, and gyms. When it comes to colas and other soft drinks, vending machines that offer these are still quite popular. However, offering nostalgia Coke machines with the bottles is very popular, though also more expensive to maintain. Toy vending machines business ideas continue to be very popular at airports, game rooms, and other places that children and teens tend to hang out. Newspaper vending machines are still very popular at convenient stores, even with the advent of the Internet, people still enjoy an actual newspaper. Specialized vending machines are very popular such as those that sell small electronics, but these are more expensive to maintain and carry a higher risk of theft. Water bottle vending machines are very popular in the United States as people look for healthier items to drink. Trap 1 - Choosing The Wrong Location. Take some time to choose the best locations, if you put your vending machine in the middle of nowhere, no one will find it. Also, make sure the machines you place are relevant to the location, in other words, do not set up a newspaper vending machine at a five-star restaurant. Trap 2 - Choosing A Vending Machine Location That Has Too Much Established Competition. Do your research on the vending machines business in your area, if it is flooded, check a town or city nearby. Trap 3 - Forgeting to Negotiate. Good locations are hard to come by in the vending machines business, therefore, be prepared to negotiate for your spot. Trap 4 - Starting Too Big. Start small, do not invest your life's savings into buying every vending machine you can afford. Buy one and see how that works for you, then continue expanding. Trap 5 - Not Servicing The Vending Machine Properly. Never let your vending machine sit half empty because when it looks empty, people assume that what's left is old. Also Make sure to service your vending machines when people are less likely to want to use it. In other words, do not service your machine during a lunch hour rush. While a vending machine business will not make you a millionaire overnight, it can provide you with a few hundred dollars/week. Over time, your earnings from your vending machine business will add up. Also, as you learn more about what it takes to be successful in your vending machine business, you will be able to add on a few more machines and in few more locations. As you gradually add more to your business, your business can eventually lead you towards earning even more money. To ensure that your vending machine actually earn you a profit, it helps to stay focus on five key things you can do to ensure that your vending machine business is a profitable business. Research the product you want to sell in the vending machines business. Make sure you get the best locations that are available. Service your vending machines and keep them stocked. Continue to look for new vending opportunities and invest profits into new machines. Do not place your vending machine next to another that is selling the same product.